» A Playoff Trick: Will the Wizards’ Postseason Success Make Washington More Appealing to Kevin Durant? 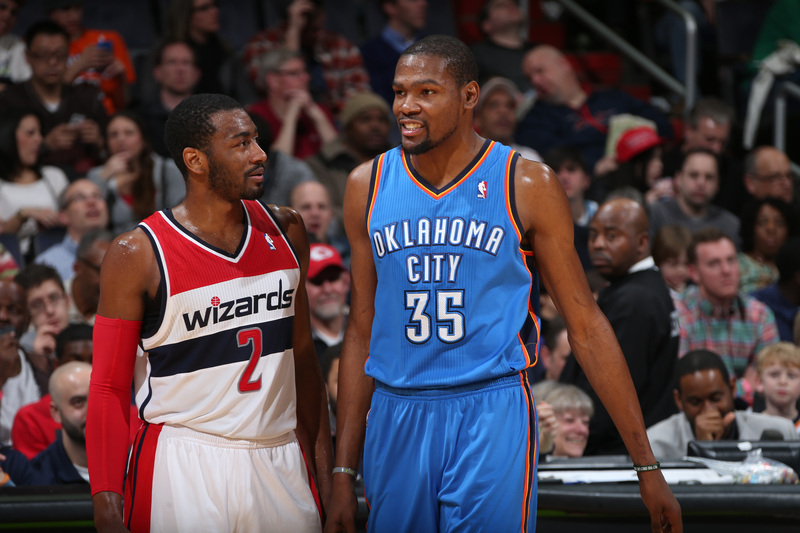 A Playoff Trick: Will the Wizards’ Postseason Success Make Washington More Appealing to Kevin Durant? The Wizards swear they weren’t playing possum in the regular season — that refusing to slot Paul Pierce at power forward, ignoring the 3-point line, benching their starting center in crunch time, and mothballing Otto Porter weren’t parts of a long con on future playoff opponents. Things just happen. That’s a fitting slogan for a team with a rebuilding path so haphazard that you couldn’t replicate it if you tried and a future that remains blurry beyond the unspeakable dream of luring Kevin Durant home next summer. The Wizards will have to convince Durant that he is the missing ingredient — that the current core, including the coach, is one piece away from championship contention. Ask a dozen rival executives whether Washington will have a persuasive case, and you’ll find an even split between believers and chuckling skeptics who view John Wall as the lone bankable star on a team that looks better than it is because it plays in the East. Of course, resident status in the East will be part of Washington’s pitch. LeBron tramples forgettable rivals on the way to the Finals every season, and even if you find Porter and Bradley Beal unexciting and unproven — I’m more hopeful than that — it’s hard to pinpoint an Eastern Conference team who might offer Durant a better surrounding roster. The Cavs probably won’t have cap room; the Bulls are rickety; the Nets and Knicks are drunkenly wandering in the wilderness; the Heat are a mystery beyond next season; the Hawks have a sneakily tumultuous summer ahead; the Raptors could be detonated; the Bucks are years away and in Milwaukee; the Pacers are back in the lottery and practically begged Roy Hibbert to go away; and the Sixers and Celtics are unformed blobs. The Wiz right now are a nice 45-win team that would be roadkill in the West and don’t have a high draft pick on the horizon. Nobody wants to be stuck in 45-win mode. Free agency represents Washington’s cleanest path to something greater, but if it doesn’t land Durant, the Wiz could stall without killer player development and creative thinking from a front office that hasn’t always displayed it. Porter and Beal are among the most divisive young players in the league. Beal has a silky shot, but he jacks an eye-searing number of midrange jumpers that mostly miss. He’s a tentative driver who pulls up early, and he once again ranked as one of the worst pick-and-roll ball handlers in the league this season, per Synergy Sports. Wittman has a bizarre crunch-time love affair with Beal pick-and-rolls, even though those plays turn Wall into a passive bystander with a shaky jumper that defenses don’t respect. Beal grinds on defense, but he can’t bang with the league’s biggest wing players, and he sometimes gets lost navigating screens on and off the ball. When he broke out in the playoffs last season, there was chatter about Beal getting a max contract when his rookie deal expired. But he plateaued this season amid nagging leg injuries, and though he’s barreling to the rim with more authority in these playoffs, he’s still shooting just 39.4 percent overall. There is very little in his dossier to suggest a star worthy of a max salary. There is very little in Porter’s dossier, period. He has exploded with 263 minutes of strong postseason hoops after nearly 1,800 minutes of being a total NBA nonentity. Much of that playoff surge has come amid smaller lineups, with Pierce at power forward, that barely played before the first round; Porter has logged nearly as many minutes alongside Pierce in eight playoff games as he did in the entire regular season, per NBA.com. It’s unclear if Porter can sustain this in lineups featuring two big men crowding the lane, or whether Wittman now views the smaller groups as a key part of Washington’s identity going forward — even beyond Pierce’s tenure. Wittman got the job because he was around when the Wiz mercy-killed Flip Saunders, and he deserves much more credit than he’s received for crafting a top-five defense around Nene and Gortat patrolling the paint. The Wiz aped Tom Thibodeau’s style and nurtured a smashmouth identity. It has been harder to tell what Washington wants to be on the other end. The offense has been an uninspiring mishmash of predictable sets, wasted time, and antiquated shot selection. Washington thrives with Wall pushing the pace and zooming through pick-and-rolls, but the Wiz can’t play that way consistently with two bigs rumbling up and down the floor. Wittman has nudged the offense in that direction during the playoffs by playing Pierce and Drew Gooden more at power forward. Maybe that’s a good sign for his future. To win a championship, a team needs to be a shape-shifter. Some opponents require more size and rebounding. Others pack the paint so tightly that you’d better have smaller and faster lineups that offer more shooting — but don’t fatally compromise the defense. That kind of malleability is why Boris Diaw was such a crucial piece in San Antonio’s championship run. Wittman did use Gooden a ton in the regular season, but there isn’t much coherence in how the Wizards have built their offense over the last three years. The big picture has the look of a team throwing random crap at the wall, not slowly refining a system that would eventually be greater than the sum of its parts. And that’s the interesting question here: How proactive do the Wizards want to be in courting Durant? If he’s healthy, Durant is so damn good, you can instantly construct whatever identity you’d like around him. But after eight years getting by on talent, perhaps Durant would like to see something more in place before venturing out of what is a pretty damn good situation in Oklahoma City. If the Wizards don’t think Wittman is the coach to take them to the next level, or if they sense Durant may not think that, shouldn’t they move to find that coach now — a year ahead of Durant’s free agency? Stasis tends to win out in D.C., especially when the team is doing well. That is the curse of being in the East: The conference is so weak, the Wiz have a legitimate shot to make the Final Four without Wall. Getting that far makes a big shakeup politically dicey. It’s easier to be complacent, even if success is in part a mirage stemming from the league’s geography-based conference system. But the Wizards are building something real here, and being in the East is a legitimate edge that should color the way the team sees itself. If getting to the Finals is easier, winning the title is easier. The East has produced its share of sacrificial lambs, including the 2007 Cavs and 2002 Nets. But teams we remember as hopeless victims were a few breaks away from making a real fight of the Finals. The 2003 Nets nearly forced a Game 7 against San Antonio, and even a big Finals underdog is one injury away from a puncher’s chance at the ring. And there are reasons to be bullish on both Beal and Porter — especially if Wittman, or some new coach, molds an offense that better fits their skill sets. Washington has over-stretched Beal’s ballhandling, but that might be healthy for him in the long run. He’s still only 21. He might not be able to work the pick-and-roll against a set defense, but slogging through that process now will turn Beal into a vicious secondary ball handler. When Wall bends the defense and dishes to him, Beal has the chops to blow by defenders closing out on his jumper, slice into the lane, and actually do something productive. Porter’s improvement has come within a tiny sample size, but the way he’s doing this bodes well. He has looked like the perfect role player for a modern offense. He’s a Choose Your Own Adventure threat spotting up around Wall pick-and-rolls. The Raptors and Hawks have ignored him to clog the lane, and Porter has punished both of them by draining 3s of all varieties — corner 3s, contested 3s from above the arc, and wide-open jobs. “If they want to help off me and give me 3s, I’ll hurt ’em,” Porter says. Maybe that won’t last. But Porter improved his shooting over the course of the season, and has morphed with frightening speed from a guy you’re fine leaving open into someone who inspires a little pang of panic when he rises for an open triple. He’s a terror on the glass, a canny off-ball cutter, and a committed defender who flustered DeMar DeRozan in the first round. Porter is still grasping the speed and geometry of NBA offenses. He’ll space out and lose track of his guy, a habit that made him the dolt in one of the season’s funniest Vines. “I can make up for things,” Porter says. That doesn’t mean Washington can rest. The Wizards’ M.O. has been to shower their young players with as much money as possible as soon as possible, and it will be fascinating to watch Beal’s contract extension talks with that history in mind. Beal could sign a four-year extension this summer that would kick in for 2016-17 and eat into the cap space the Wiz have carved out for Durant. A max deal for Beal would start at about $21 million, leaving Washington with almost exactly enough space for Durant’s max deal — and almost nothing more.3 The Wiz could open up breathing room by dealing Martell Webster, or waiving him, but the Durant math will still be very tight if they lavish an early max on Beal. They would not be able to sign anyone else to a multiyear contract this summer, thereby punting on any short-term upgrades,4 and they would have limited resources to fill the rest of the roster in the summer of 2016. The Wiz could take a harder line in negotiations, or even coax Beal into waiting until the summer of 2016 to re-sign as a free agent after Washington uses its cap space. Beal in that scenario would appear on the books as a $14 million cap hold5 — a hefty price, but nearly $7 million less than his max salary on an extension. That extra room would make it easier to get Durant some help before the cap rises again in the summer of 2018. Washington has a carrot: the extra fifth year it can’t offer Beal in an extension, but could attach to a new contract in free agency. It’s a random, unplanned quirk the NBA and union sloppily wrote into the collective bargaining agreement during the frenzied final hours of the 2011 lockout. A team can offer only one of its players a five-year extension, and the Wiz fired that bullet on Wall. But they can still re-sign their own free agents to five-year deals, provided those players actually get to free agency. It’s an oddity that gives players some incentive to wait, even if they would love to stay with the team that drafted them. But waiting risks injury, and given Beal’s repeated leg issues, he may want lock in as much money as possible right away. And if Beal wants security, the Wiz should ask him to trade some dollars instead of opening up the vault. That is just due diligence. You don’t sit back just because things are going well with the current group. Smart teams always look for something better, and the Wiz will need a Plan B if Durant spurns them. After all, Durant already has a speed demon point guard and a roster that can sniff 60 wins — plus a shiny new coach. The Wiz, by the way, have quietly done a lot of smart stuff that belies their reputation as an organization playing checkers while the best teams play chess. The path to this point was ragged. The Wiz blew a bunch of high draft picks — first by trading one for Randy Foye and Mike Miller in a rush to chase 48 wins, and then by just whiffing. They sold second-round picks like cheap candy, most recently flipping the pick that became Jordan Clarkson for some sweet, sweet cash and the ability to open a roster spot for a retread. They extended Andray Blatche, and then amnestied him. They needed lottery luck to vault up the Wall draft, sat out the James Harden trade talks, and built a roster with a doughnut hole where a prime-aged player should be. But they’ve started to nail the little things. Pierce has been a huge plus, on and off the court, and the Wizards turned trade exceptions into bargain deals for Kris Humphries, DeJuan Blair, and Ramon Sessions — and even more trade exceptions. The trades for Nene and Gortat, controversial at the time, turned out well. They have four people doing analytics and a well-regarded training staff. We just haven’t seen the Wiz with major cap room in a while. They punted that possibility in the summer of 2012 by dealing Rashard Lewis’s nonguaranteed deal for Trevor Ariza and Emeka Okafor, and if Durant signs elsewhere, the Wiz will be competing with just about everyone for the same pool of sub-superstar free agents. Should we trust them to pick the right backup plan and actually implement it? Al Horford is an obvious Durant fallback — a Nene replacement who brings the same all-around game, but with more shooting. But Horford will have a dozen suitors, including the Hawks, who could outbid everyone. No one knows how the free-agency landscape of 2016 and 2017 will play out, but if everyone has cap room, offering money alone may not get it done — especially in a market with little history of drawing big-time free agents. The Wizards are good now, and they should stay good for a while. But becoming great is hard, and it takes some luck. Get lucky enough and the path opens wide before you. If Durant thinks Wall is a top-10 player and is just dying to play with him, this other stuff won’t matter. But if things get more complicated, as they surely will, an organization that hasn’t made the good-to-great leap in 40 years will have work to do. Plus the players they draft over the next two years. When I replied that the Wizards seem to win games in the playoffs these days, Gortat wasn’t having any of it. “We’re playing in our second playoffs in, what, 10 or 15 years? That’s really great.” He was being sarcastic. That estimate includes 2015 and 2016 draft picks, and no money for any of Washington’s key outgoing free agents over the next two summers — Nene, Kris Humphries, Ramon Sessions, and others. The Wiz could use the midlevel and biannual exceptions this summer, and teams that have access to those tools should work like hell to get veterans on multiyear deals with them. They are basically use-it-or-lose-it tools this summer, since they vanish with cap room. Getting useful vets for two or more seasons would be a coup, but agents also know that, and will push for one-year deals ahead of the cap spike. That’s an artificial charge linked to any outgoing free agent, designed to limit teams from signing outside free agents with cap room and then re-signing their own guys. Beal’s is currently estimated at about $11 million, but it will shoot up to $14 million once the league’s average salary leaps over Beal’s actual salary. Basketball is fun. The Kings should obviously reject that package for DeMarcus Cousins, but you never know with the Kings.